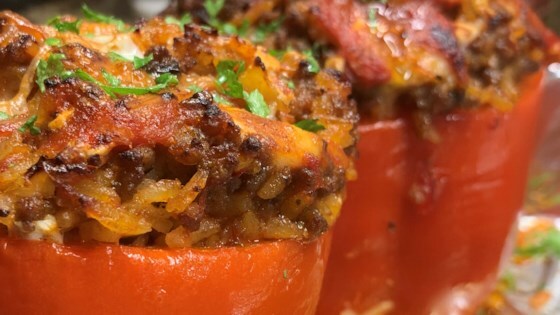 "Stuffed peppers with beef and mushrooms." I cut the rice in half and still had enough filling for 8 peppers! They were tastey but I added some red pepper chilies to spice them up. DEFINITELY cut the rice in half! Two cups makes a HUGE amount. Tstuffing was soupy and the peppers fell apart..i ended up putting them down the disposal...i will NEVER make these again...! !